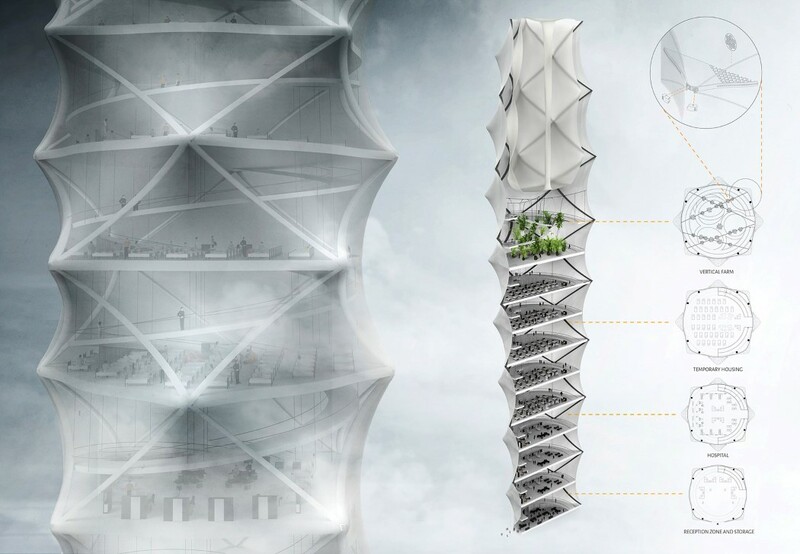 Golden Prize winner at the eVolo Skyscraper Competition 2018 the Skyshelter.zip is literally the physical manifestation of a zip file. The compressed building gets transported via helicopters to disaster-zones. The zip is as wide as a building but remains vertically compressed until it’s ready to expand. This compressed building is tethered to the ground to make it secure, and then a load-bearing helium balloon on the top of the building rises upwards, expanding the building like a bellow expands with air. As the balloon rises and the building increases in height, fabric panels used to create the external and internal walls would unfurl rapidly, and 3D printed plates would be lifted in succession by the balloon, creating floors and different zones. Depending on how tall you want the building, you’d fill more gas into the balloon and add more floors. The Skyshelter would come with a lobby, first-aid bays, temporary housing, a storage unit, and even a vertical farm. What’s incredibly interesting is that while it’s easy and quick to deploy, it can be compressed back too, making it perfect for temporary use on sites that need rehabilitation, and moving on once the job is done! More and more natural disasters happen annually across the world. When dealing with forces so powerful, standard means of crisis-management often prove to be inefficient. Whether the certain region is struck by earthquake, flood or hurricane – help needs to arrive quickly. This is often easier to be said than done, as damages to transportation infrastructure or remote localization can make it extremely difficult. The Skyshelter.zip tries to address these issues by proposing a structure that while offering large floor surface is compact, easy to transport anywhere and can be deployed with a minimum amount of time and manpower requirements. It is meant to serve as a multi-purpose hub for any relief operation. The Skyshelter.zip is extremely easy to move due to its unique qualities. 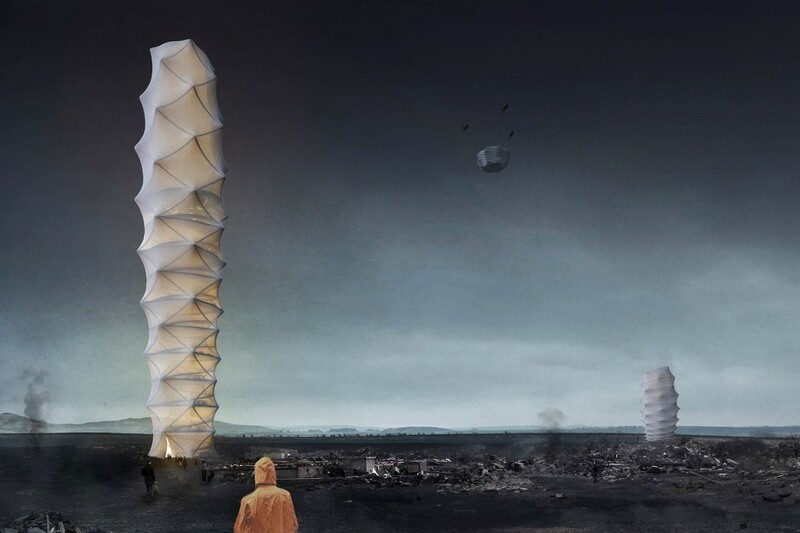 The entire structure is foldable in a manner that resembles origami or accordion. This means it can be neatly packaged into the single relatively small box with minimum height and base dimensions reduced to building’s footprint. Then such a package can be moved anywhere with help of helicopters commonly used by rescue teams and military in the event of natural disasters. Because elements do not have to be transported in batches by trucks, it is easier and faster to reach zones cut off from the transportation network. Perhaps the biggest advantage of stacking vertically all functions required in the zone affected by natural disaster is reducing the area that is being occupied by them. Skyshelter.zip’s footprint is on average over 30 times smaller than the area required to host typically used tents or containers. This means that much less cleanup work is required prior to setting up the camp. This is especially important in densely populated areas but elsewhere means that it is going to be possible to set up those temporary shelters closer to victims original homes. Just as easily as it can be transported, the Skyshelter.zip can be effortlessly and instantly deployed even on unstable soil. Little to none groundwork is required as after anchoring basic supports to the ground the structure unfolds thanks to large load-bearing helium balloon placed within (thus protected from external forces). This process is also easily reversible. Light-weight 3D-printed slabs are attached directly to balloon in succeeding manner and pulled upwards by its load-bearing force and structural steel wires that once strained are capable of resisting horizontal wind forces. In turn, internal and external walls are in fact pieces of fabric attached to slabs that unfold as the structure get deployed. Depending on the amount of gas poured into the balloon, one can control the number of floors that are unfolding. This way, with single, mass-produced module it is possible to attend different-scale, unpredictable events. Based on particular cases’ needs various functions can be accommodated inside, including the reception area, first aid area, temporary housing, storage and vertical farm that uses soil gathered during anchoring. An additional advantage of producing vertical emergency camp is its height, partially achieved thanks to the size of the balloon. It allows for the structure to serve as a landmark, visible from large distances helping guide people affected by catastrophe straight to the relief center. Taking advantage of the large external surface area, use of nanomaterial-based on ETFE foil and infused with a network of small perovskite solar cells was proposed. This way, the building is capable of producing clean energy especially needed in case of emergency. Similarly, the balloon located on top is shaped in such a way, that rainwater is able to flow through its hollow center where it is being cleansed by specialized filters and collected for further use. Designers: Damian Granosik, Jakub Kulisa & Piotr Pańczyk.